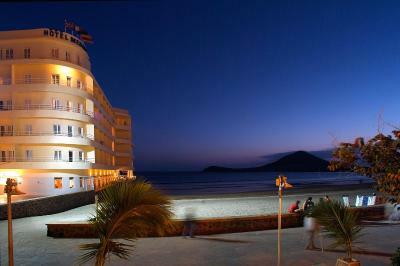 Lock in a great price for Hotel Médano – rated 8.1 by recent guests! The room was good and we had a lovely view over the beach and saw some beautiful sunsets. Plenty of hot water for showering. Pretty nice hotel. It is very basic and simple but clean and cozy. The view is fantastic. it is located in small and quiet town. the food is basic but OK. there are a lot of good and inexpensive restaurants and bars around. There are nice trails for hiking around. 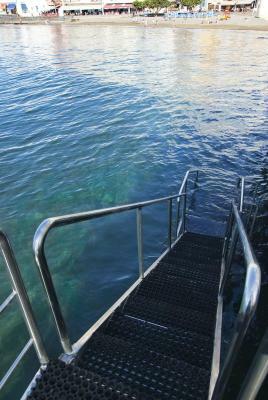 I loved jogging in the morning and then sit in a cafe nearby, order fresh orange juice and cup of coffee, and enjoy the ocean view. 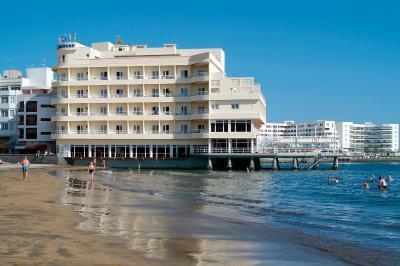 Great hotel located on a pleasant beach in the middle of El Medano. 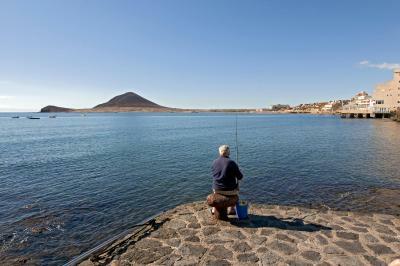 Beautiful views of the ocean, shoreline and La Montana Rioja. 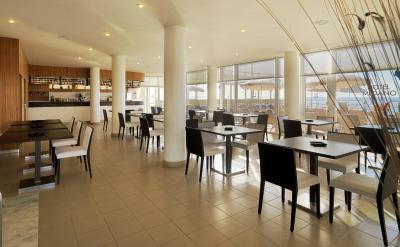 Several cafes and restaurants were located nearby around a busy plaza, and the airport was 10 minutes away. 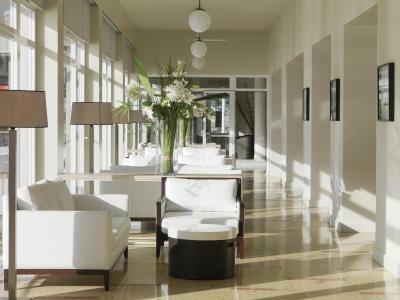 We also loved the clean, retro design of the hotel. 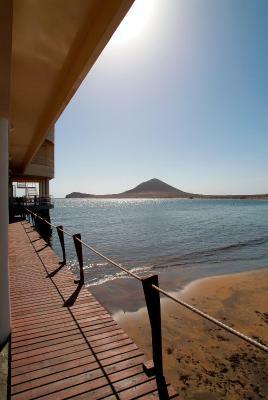 Prime location in the middle of El Médano, right between beaches and built out above the waves. 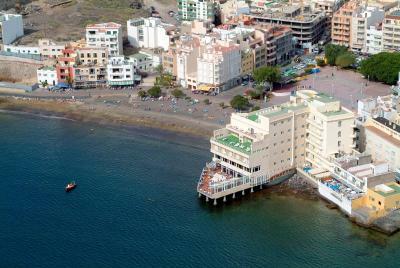 The town itself is full of great cafes and bars to explore and public transport is cheap and easy to access. There was lot of options for breakfast but unfortunately I didn't like the food in general. Specially dinners, there was no any spices in the food, It felt very tastles. I wouldn't suggest half board as there is much better and cheaper food in the local restaurants. Room was very clean I was very happy with that but the bed wasn't very comfy. It was pretty hard and "double bed" was two beds together. Lady on the reception (I think her name is Marisol) was one of the most friendliest staff at the hotel where the staff at the restaurant are not friendly at all. 1 minute after the breakfast is finished 10:01 They are turning off the lights in the restaurant and closing the blinds even though half of the restaurant is still finishing their breakfast. 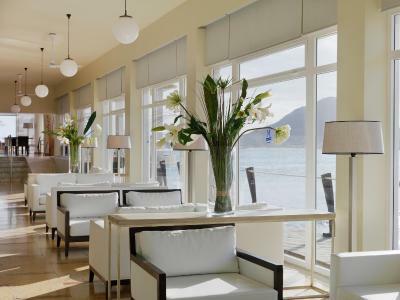 This is a great hotel to stay in, we have stayed here many times the staff are very welcoming, the rooms are extremely clean and comfortable and the food is very good. No negatives. 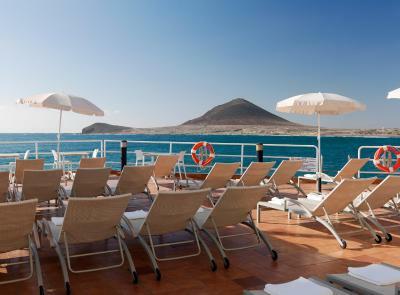 Right on the sea and exceptionally clean. Our room was literally overlooking the waves! 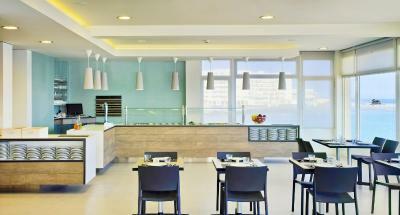 The staff, the location, the spacious room and basic facilities were good. 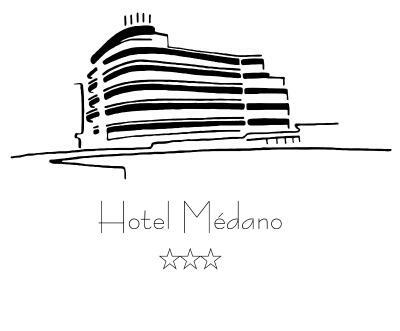 Hotel Médano This rating is a reflection of how the property compares to the industry standard when it comes to price, facilities and services available. It's based on a self-evaluation by the property. Use this rating to help choose your stay! 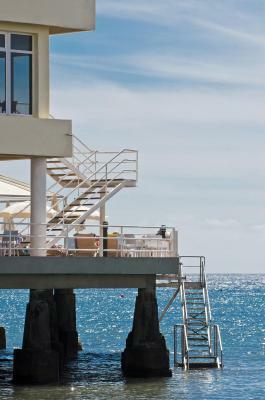 Located on Médano Beach, this modern hotel has a 2-story sun terrace which forms a jetty surrounded by the ocean. 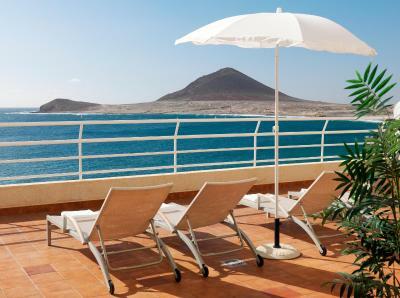 The stylish, bright rooms at Hotel Médano feature satellite TV and a private balcony overlooking the ocean. There is also a private bathroom. 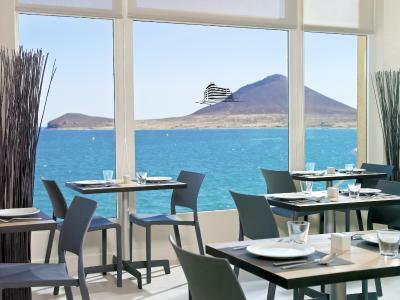 The Médano’s elegant restaurant offers fantastic ocean views from its large windows. Packed lunches are available if you are planning a day trip. 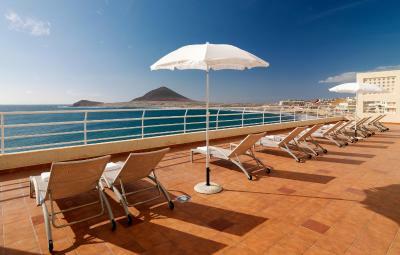 The hotel’s 4 large sun terraces offer great views of Red Mountain just across the bay. 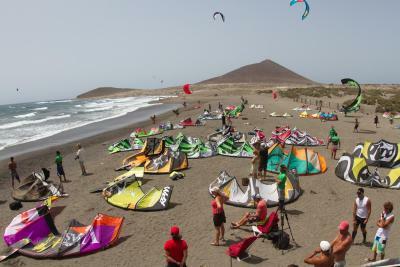 Médano Beach is a popular destination for windsurfing, kitesurfing and scuba diving. 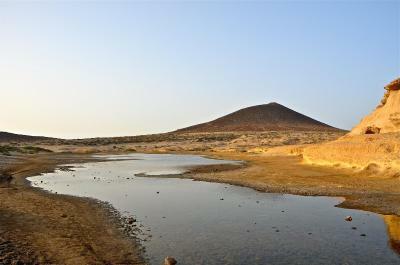 Amarilla and Sur Golf Clubs are both around 20 minutes’ drive from the hotel. 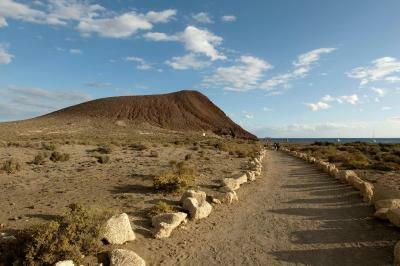 Tenerife Sur Airport is a 12-minute drive away. 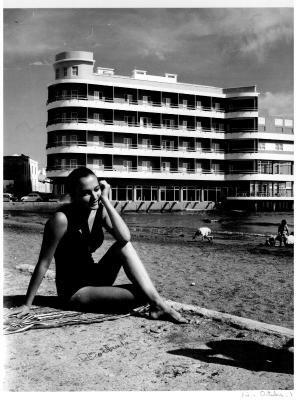 When would you like to stay at Hotel Médano? 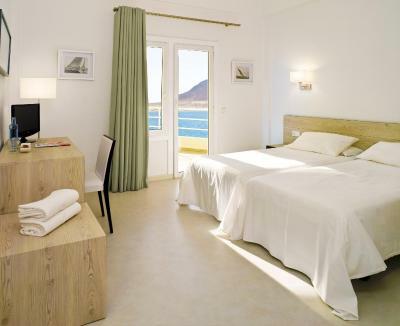 This stylish, bright room features satellite TV and a private balcony with amazing ocean and beach views. There is a private bathroom. Hairdryers and irons are available on request. About the Hotel The hotels unique location on the seafront means that you are able to walk directly into the Atlantic Ocean from its beautiful 500m2 terrace and take a long well deserved swim. The terrace also boasts some spectacular views both of the Red Mountain, the only mountain on the island that’s made up of red earth, and also some of the most colorful and warm sunsets and sunrises. 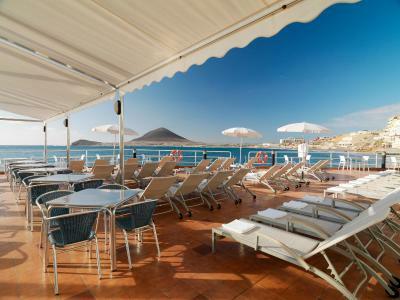 Furthermore, the panoramic views and the enjoyable nature of the seaside town of El Médano will surely leave you wanting more. 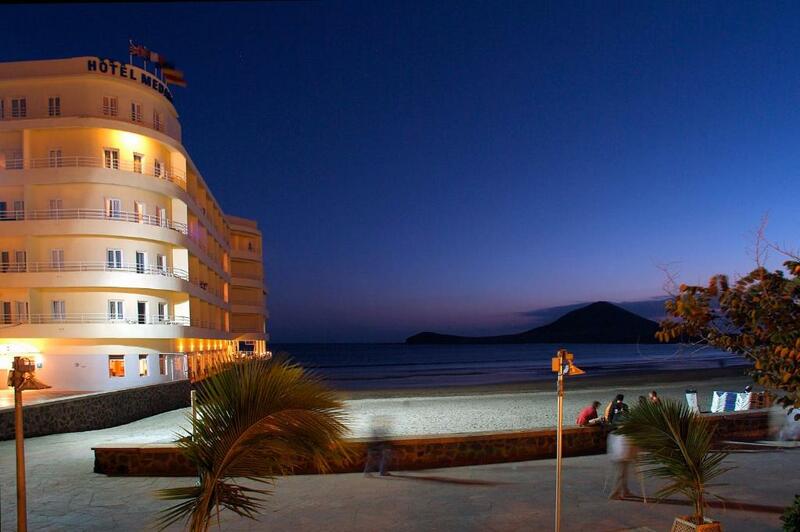 We would love to invite you so that you can get to know El Médano Hotel better. 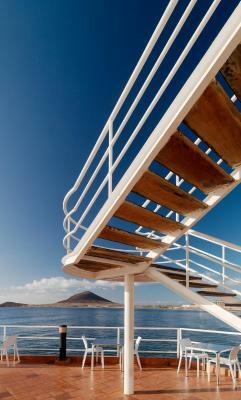 House Rules Hotel Médano takes special requests – add in the next step! 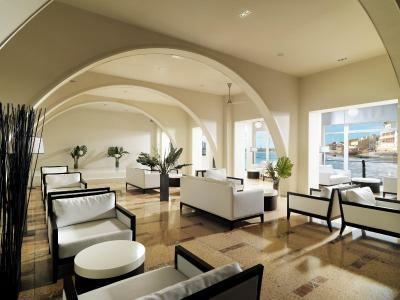 Hotel Médano accepts these cards and reserves the right to temporarily hold an amount prior to arrival. Double bed was two singles pushed together but not fixed together. Woukd have been nice to have a singer or music in the lounge. The restaurant featuring cockroaches in the dessert fridge, food that I would not serve to my dog were VERY high amongst the things I did not like. The hotel director who promised immediate improvement and delivered for three days before it reverted to atrocious. Do NOT eat at this hotel We ate out of the hotel the half of our holiday. We were told they DO NOT reimburse BOOKING.COM CUSTOMERS for food, so obviously lots of complaints and no customer satisfaction, especially for your clients! Breakfast was excellent. In contrary to this, buffet in the evening was not that good. The dining facility was like a low class cafeteria, but with a great view. Food was not warm We had a room towards the beach, it was beautiful! The hotel itself is quite old, and you see and hear this when you are in your room. Even with 2 doors, the noise from others where quite distinct. The quality of the food, particularly some dinner menus. The staff are wonderful and service levels very good. The quality of the food in the restaurant was inconsistent depending on which chefs were on duty. The food in the dining room for breakfast and dinner was awful. At breakfast the eggs were burnt the bacon was barely cooked and the rest of the hot selection was barely edible! We had cold meat, cheese and fruit every morning, not that there is anything wrong with that but you get a bit bored with the same every day. The dinner at night was even worse. It was usually cold, and hard to determine what it was. Even vegetarians would struggle!! You are given a 45 minute slot to eat your dinner, not enough time to get your food and drink let alone eat it!! We ate out quite a lot. 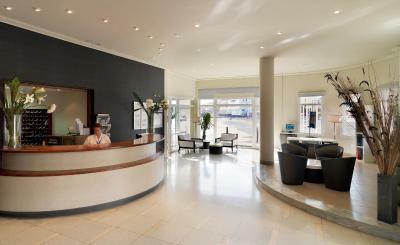 The staff at reception were not very friendly, they did not acknowledge you and if you spoke to them they were very abrupt, (you felt as if you were interupting them from their computer)!!!! Loved everything about this hotel. Have stayed there on many occasions and hope to stay again in the future. Very bad food in the restaurant. Bad manager. Slightly dated decor and furnishings. Slightly cramped room. Location. Friendly helpful staff. Clean. Good food. We went for the sunshine in the middle of winter and we weren't disappointed!